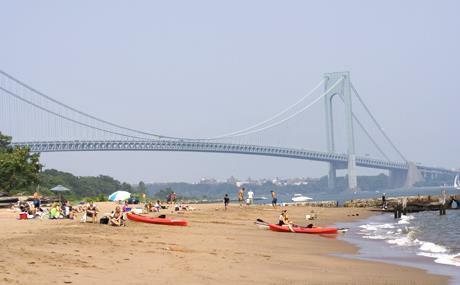 Here are just a few beautiful beaches around the area of Manhattan. Manhattan Beach, NYC - Located at Oriental Blvd and Irwin Street Brooklyn, NY 11235. Manhattan Beach is one of the nicest beaches within the 5 boroughs with plenty of room to throw down a blanket and take in the sites and ocean breeze. You can ride your bike all the way down to the beach, but when it is hot it's easier to just hop on the train. When you're not napping on the beach, or jumping in the water to escape the heat, you can enjoy people watching on the boardwalk. History - The quarter mile beach was once known as the World's Largest Privately Owned Playground by Life Magazine. But before that it was changed into a Coast Guard base soon after the Japanese bombed Pearl Harbor. Robert Moses reclaimed the land and returned it to the public. Today - There are many stately mansions lining the streets directly behind the shoreline and surrounding Manhattan streets. A stroll down the boardwalk is not to be missed and Kingsborough Community College sponsors outdoor summer concerts on the manicured peninsular campus. The school is part of the City University of New York and occupies the entire eastern tip of the beach. Brighton Beach - Located at Coney Island Ave. and Brightwater Ct. Brooklyn, New York 11230, Brighton Beach has many restaurants, food stores, cafes, boutiques, banks, etc., located primarily along Brighton Beach Avenue and its cross streets. History- In the late 1800's, German-American railroad magnate, William Engemann first developed Brighton in the hopes of attracting the middle class. Today - The neighborhood has a distinctively ethnic feel, akin to Manhattan's Chinatown. 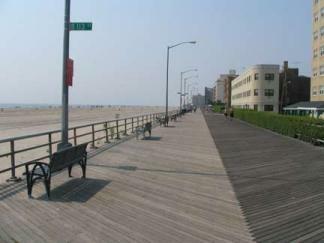 The proximity of Brighton Beach to the city's beaches (Brighton Beach Avenue runs parallel to the Coney Island beach area and the Boardwalk) and the fact that the neighborhood is directly served by the Brighton Beach Avenue subway station, makes it a popular summer weekend destination for thousands of New York City residents. Coney Island - Located 1208 Surf Ave Brooklyn, New York 11224, Coney Island is partly a peninsula at both the western and eastern ends. The island in its entirety is about 4 miles long and 1/2 mile wide. There are roughly 41,000 residents living in Coney Island today. There is a colorful website showing recent work done on the History of Coney Island.